A hospital in Scotland has some unusual new workers, a team of mechanised porters. There are a lot of tasks in a hospital that are pretty monotonous, linen that needs changing, medication that needs dispensing and general fetching and carrying. But a hospital in Scotland has a novel way of dealing with this kind of work: make robots do it. The new Forth Valley Royal Hospital in Larbert, Stirlingshire has been built with the robots in mind, and has a special network of corridors running underneath the hospitals for the robots to traverse. "[The new hopistal will be] packed full of design features to improve patient care and improve the life of staff," said hospital spokesperson Ian Mullen. "Members of staff will use a hand-held PDA to call up the robot to move meal trays, or linen, or whatever. The robot will come up in the service lift by itself, pick up the item and go back into the lift." The robots, which navigate using lasers, will hopefully be a big help in dealing with infection, as well as freeing staff up to spend time with patients. "Traditionally, clean and dirty tasks are carried out by the same person," said Lesley Shepherd, an infection control nurse. "Here, you'll have the robots that do dirty tasks, so they may take dirty linen or clinical waste away, and you'll have robots that do clean tasks, such as bringing meals and clean linen to patients. They have separate lifts so there's no way they can cross, which is great." The hospital, which opens in August, will also have a robotic cleaners and a robot that fills out prescriptions in the pharmacy. 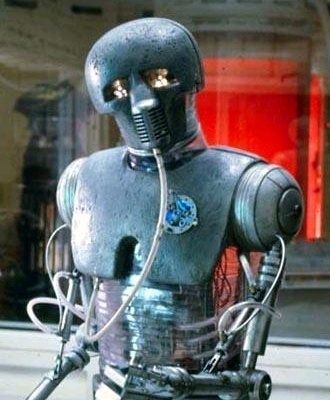 As yet, robot doctors - like the one pictured - are still just a fantasy, but that's only a matter of time, surely.